Let’s have a fun meeting new people in this cherry blossom season! 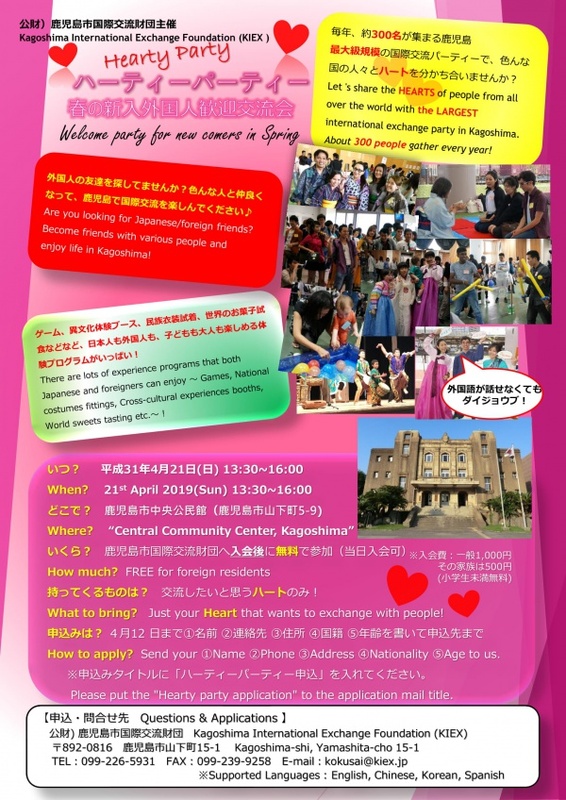 We are holding a welcome party for the new foreign citizens who come to Kagoshima this spring. Let’s enjoy international exchange in this great opportunity and we really hope your participation! 日本語教室（にほんごきょうしつ）特別(とくべつ)イベント(いべんと)のお知(し)らせ Notice for One Day Special Session of Japanese Class! We will hold a one day special session of Japanese class on March 19th! Anyone who wants to improve your English can participate in this class. くわしくはこちらThe detail is on the attached file. Please apply till March 8th (Fri) those who are interested in this session. Please give your hands for making our Japanese class a better one. We will present Japanese sweets that you can feel spring season in it. Thank you very much your kind cooperation!